Personnel with Southern California Edison (SCE) and the Long Beach Fire Department (LBFD) at the scene of an underground fire. Photo by Dennis Dean. 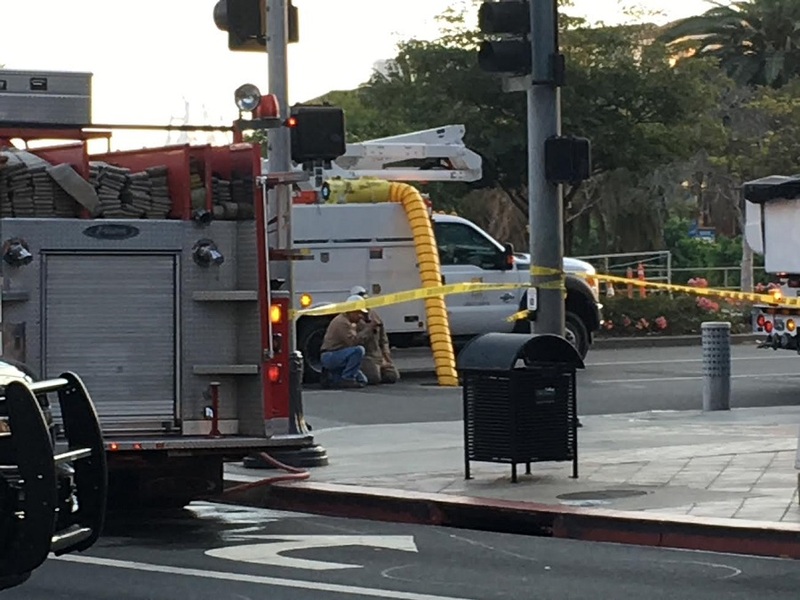 A fire under one of downtown Long Beach’s streets Monday evening was caused by trash in a pipe that ventilates underground electrical vaults, according to Southern California Edison (SCE) officials. Long Beach fire units initially responded to reports of smoke from an electrical vault on Pine Avenue and Ocean Boulevard yesterday at 5:43PM, said Long Beach Fire Department (LBFD) spokesman Jake Heflin. Firefighters eventually extinguished the fire that took place in a vent pipe stuffed with trash, according to Edison spokesman Robert Villegas. The pipe was located in front of one of the businesses, he said. No equipment was damaged and no power outages were reported. The ignition source was undetermined, said Villegas, who noted that in previous cases people have disposed cigarette butts in the vents, which officials believe potentially caused trash stuffed inside to catch on fire. Edison officials also reminded smokers to fully put out cigarettes and properly dispose of them in designated areas.